BY CHRISTOPHER MALENEY FILM CRITIC If someone asks you to name the essential hallmarks of a Western, what would you say? The cowboy hat? The gunfight at high noon? The frontier town with running saloon fights and and anything-goes frontier feeling? The lone gunfighter on a quest for extrajudicial revenge against a villain too powerful for the law to contain? From Shane to Fargo, each retelling of the western — every reshuffle of the tropes — offers a different interpretation of the quest for justice in America, but all ultimately assure as that it can be found with the help of a gun or a fist, that it can be found at all. 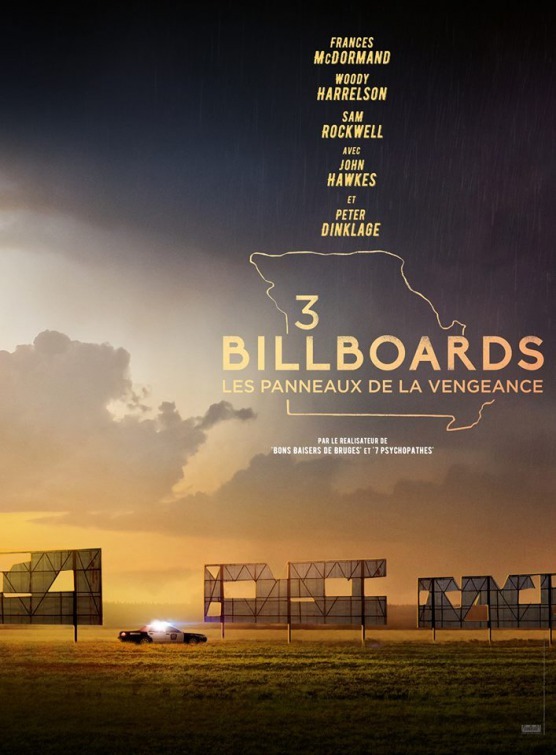 Three Billboards Outside Ebbing, Missouri is not a classic western, but, make no mistake, it is a western. When the investigation into her daughter’s vicious, senseless murder is seven months stalled, Mildred Hayes (Frances McDormand) rents the titular three billboards to ask Chief Willoughby (Woody Harrelson), quite publicly, why no progress has been made on the case. From this simple act comes a drama that changes the face of Ebbing, Missouri. The question at the center of Three Billboards is: What does it take for a poor person to earn justice? Without money or influence, they have little ability to emphasize the importance of their plight. As often as not, the poor end up placed in an adversarial position with the law where they can be arrested or assaulted at any time by the police with little to no legal recourse available. Even in the best of times, as Chief Willoughby explains to Mildred, a case can take months or years to solve. Even when evidence is present, the evil that men do can often go unpunished because the job of the police is not to protect or serve individuals, but to protect each other. As Mildred explains calmly but drunkenly to the town priest, the police — or the clergy, or the bourgeoisie — are a gang working together and complicit always, even when they do not know it. But even with this starkly true, rotten-to-the-core morality, Three Billboards is not an altogether cynical take on justice, though it is morally ambiguous, because every character, it seems, has a double self. The characiature of a drunken, racist, cruel, incompetent cop that is Officer Dixon (Sam Rockwell) still has his humanity, even if he must be literally cleansed by fire to find it. Angry Chief Willoughby, though literally and symbolically cancerous, still tries to be a good father, a good husband, and a good public figure. His eventual replacement is not the tough-as-nails fixer we expect, but just another cop with a cop’s priorities. Our hero, Mildred Hayes, has a strong exterior that turns as often to cruelty as it does to fragility. Her violently abusive ex-husband still carries an iota of tenderness, and even their mild-mannered son can wield a knife when push comes to shove. There are complaints I could make about the movie, of course. Peter Dinklage is not used to his fullest potential, for one. For another, the effects of structural racism is not fully examined, but it is assumed in many ways. One or two scenes are disjointed, out of place between each other. The ending takes a long while to get to, as the solution to Angela Hayes’ murder moves in and out of focus. This doubles as both feature and a flaw as this is not a detective movie, so it is not bound to satisfy us with answers. Instead, it asks serious questions about what policing looks like in the 21st Century, about whether redemption is possible, whether revenge is worthwhile. Go see Three Billboards if you have a strong constitution or a dark sense of humor, but don’t expect to be the same when you come out of the theater. This entry was posted on Friday, December 1st, 2017	at 12:35 am	and is filed under News	. Responses are currently closed, but you can trackback from your own site.